Monica Howse 15, the daughter of Flesh-N-Bone of Bone Thugs-N-Harmony is missing. “She was dropped off (at work) by a family member and didn’t come home,” she said. Flesh-N-Bone, whose legal name is Stanley Howse. According to, E!News singer Frank Ocean debut album will not be sold at Target. The mega retailer announced it will not carry “Channel Orange,” a decision that came after the singer revealed his first love was a man via Tumblr last Tuesday, according to Billboard. FRANK OCEAN ALBUM WILL NOT BE SOLD AT TARGET IS IT BECAUSE HE’S GAY? Jay-Z and Beyonce should appreciate their fans because, this is how the Carters are living. According to The New York Post, the family will be putting down $400,000 in rent money to stay at a $43.5 million mansion coined as The Sandcastle next month. DAYS OF OUR LIVES: Melanie seized the moment and called Chad, revealing her whereabouts in the tunnels under Salem. As Brady got to Melanie and Chad found Andrew and Gabi, a huge gas explosion rocked the tunnels, as well as the land above. While waiting for Brady to arrive at their wedding ceremony, Madison was caught with Ian as the ballroom blew up, while Nicole, also in the ballroom, suffered from cramps. After Sami protected E.J. from being shot by Roman, E.J. held her as she hung from a catwalk, about to fall as everything shook. GENERAL HOSPITAL: Unaware that a hidden camera was operating, Connie admitted to Johnny that she’s stopping Kate from fully being herself. Shaken by a visit from Anthony’s ghost, Johnny trashed the office and made an important discovery. Patrick finally decided to enter a detox program. Starr and Michael’s announcement that they’re dating caused conflicted feelings for Sonny and Kate. Todd took revenge on McBain by sending the photo of John and Sam kissing to Natalie, the mother of John’s child. Maná is a Mexican rock band from Guadalajara, Jalisco, whose career has spanned more than three decades. The group has earned four Grammy Awards, seven Latin Grammy Awards, five MTV Video Music Awards Latin America, five Premios Juventud awards, nine Billboard Latin Music Awards and 13 Premios Lo Nuestro awards. According to Wikipedia. According to London Standard Evening, Tito Jackson’s daughter Tanay Jackson thinks grandmother is too old for guardianship. Jackson says that her 82-year-old grandmother is not the right person to take care of Michael’s 3 children. I’ve never known Tito Jackson to date black Women. Tanay Jackson appears to be black. Who is her mother? Korean girl group T-ara has been struck by a wave of negative rumours as of late which has shockingly ended with member Hwayoung leaving the group. The 19-year-old was one of the newer additions made to T-ara’s lineup and has been with the group for almost two years. Prior to Hwayoung’s departure, cryptic messages posted on the personal accounts of T-ara’s original members, including Jiyeon and Hyomin, led to speculation that the members were dissatisfied with Hwayoung’s attitude towards being a performer. This was followed by rumours that she was being bullied by her fellow members. This issue surfaced after Hwayoung performed at one of their Japanese concerts while seated on a chair due to a leg injury. In a statement issued to the press at 1pm KST (12pm local time) today, Core Contents Media (CCM) announced that they would be terminating Hwayoung’s contract with immediate effect. In the statement, they expressed ‘regret’ for her departure but have stood firm on their ground that the decision was made after careful consideration and is for the best interest of the group. It stated that they have decided on the matter based on the complaints of 19 staff members regarding Hwayoung’s attitude and denied all rumours of bullying within the group. In the statement, CCM also claimed that the posts by the members were misinterpreted and in fact not directed at Hwayoung – contrary to the statement that they had issued immediately after the tweets surfaced, which claimed that the girls’ accounts were hacked into simultaneously. Following the announcement, Hwayoung posted a vague message that reads: ‘facts without the truth’ on her personal Twitter account, which netizens believe was a hint that CCM’s statement omitted vital information. CCM then issued a follow-up statement, claiming that Hwayoung had acted out on numerous occasions, exhibiting diva-like behaviour towards her fellow members and even in front of fans and members of the press. QUEEN’s (name for T-ara’s fans) have been divided over the issue following CCM’s announcement, with some condemning the termination of the contract and pointing fingers at the remaining members while others have stood by the girl group. About 6,000 fans have left their official fan café after the announcement, triggering alarm that this may lead to their downfall as a group. As many of the happenings leading up to Hwayoung’s departure are unlikely to publicly clarified, a negative cloud of rumours is likely to continue swirling around T-ara ahead of their concert in Seoul, which will be held on August 11. According to The Miami Herald, singer Thalia and her husband Tommy Mottola sold their Florida mansion. Mottola was married to entertainer Mariah Carey. Carey is now married to Nick Cannon. The late King Of Pop Michael Jackson had bad business dealings with Mottola. CEO’s Kim Kwangsoo gave a brief interview on the music bank incident and Hwayoung’s contract termination. JYJ’s Yoochun will kick off his Asia tour in Shanghai, China on August 25, 2012. Take a look at Olympian Mary Lou Retton at age 16 and now at age 44. Actor Lee Tae Gon ( 이태곤) best known as King Gwanggaeto on KBS World has decided to start his own agency to represent himself and other talents. According to KPopNeWs, “Lee wants to become an influential person who is able to help Korean actors when they make their debut in Japan and abroad,” said a spokesperson for TG E&C. Lee Tae Gon is starring in the SBS show “Law of the Jungle,” as he makes the transition to becoming a businessman. Congratulations to Mark-Paul Gosselaar and his new wife Catriona McGinn, the couple tied the knot Saturday at the Sunstone Winery in Santa Ynez, California. This is the second time around for Gosselaar,he was once married to Lisa Russell and has two children. K-pop sensation BoA in her comeback show “4354” featuring TVXQ Yunho. This a come for BoA who has been away for 2 Years. Actress Lee Yeonhee stated that BoA wasn’t taking care of her body. BoA, however, retorted, “But I exercise!” to which Lee Yeonhee pointed out that BoA complained after a bit of exercise according to Koreaboo. Music legends Morris Day And The Time, The S.O.S Band, Midnight Star and Kurtis Blow will be in concert Friday September 7, 2012 @ 7:00 p.m According to, Thunder Valley Entertainment. Click “Buy Tickets” below, call Ticketmaster at 1-800- 745-3000 or visit our Rewards Center inside the casino. Must be at least 21 years of age to attend. Guests ages 13 through 20, however, may attend if accompanied by their parent or legal guardian. According to Reuters, Los Angeles Superior Court judge Mitchell Beckloff appointed a probate investigator to interview Prince Michael, 15, Paris, 14, and Blanket, 10, “on an unannounced basis” and report back to him about the children’s welfare. Randy Jackson, who along with four other siblings last week claimed Jackson’s signature on a will benefiting his mother and his children had been forged, accused the Jackson estate of trying to kill Katherine Jackson. On again, Off again, It seems as Chris Brown & Rihanna was In St. Tropez, France. Brown’s girlfriend Karrueche Tran was there as well, it was reported Tran did not know Rihanna was there according to, OMG!. Prince Michael tweeted for the first time on the the Jackson drama, on Thursday July 26, 2012 sent out a tweet regarding his grandmother Mrs. Katherine Jackson disappearance and his group text messages with several Jackson family members on trying to speak to his grandmother and was denied along with his sister Paris. Jackson ended his tweet with strong words directed toward certain family members. He acknowledged that his dad Michael Jackson warned him about certain people and their ways, in other words, be aware of certain family members that may have a hidden agenda. 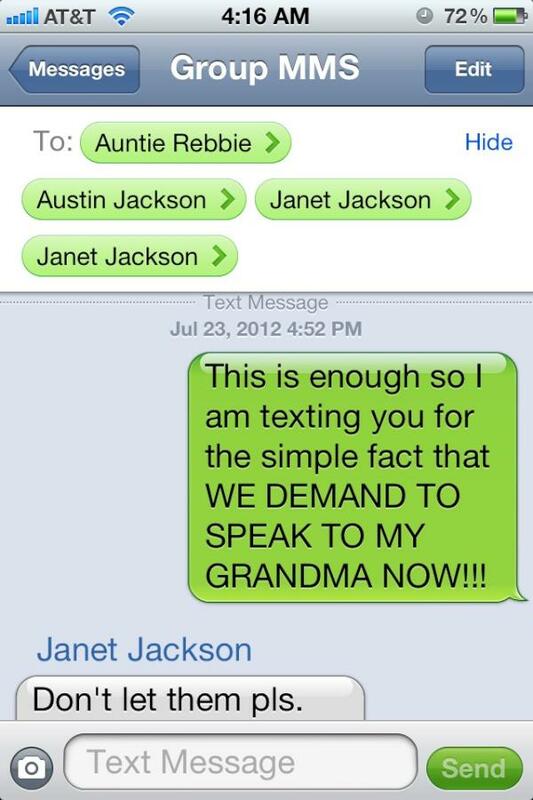 Prince Michael revealed on Twitter a group text message he sent on July 23, 2012 at 4:52 pm to his Aunts Rebbie Jackson and Janet Jackson, and Austin Jackson that read, “This is enough so I am texting you for the simple fact that WE DEMAND TO SPEAK TO MY GRANDMA NOW!! !”, he received a reply back from his aunt Janet “Don’t let them pls.” On July 22,2012, Paris tweeted, “yes , my grandmother is missing . i haven’t spoken with her in a week i want her home now.” The news of Michael Jackson’s mother missing sparked fumes on Twitter and in the media. Paris finally tweeted a happy tweet, “grandma’s here ! #thankyougod” after tweeting, “they promised my grandmother would be home YESTERDAY . why isn’t she home ?” She seemed worried again that is was another lie. Katherine Jackson is interviewed on ABC’s Nightline on Wednesday July 25, 2012 at 11:35 p.m. ET/ PT. Mrs. Jackson’s kids Rebbie, Janet, and Jermaine along with Rebbie’s daughter Stacy and a resort staff member at Miraval were with her as she read her statement from a prepared paper. She spoke about her grandson TJ Jackson, who is Tito Jackson’s son, gaining guardianship over Prince, Paris, and Blanket.